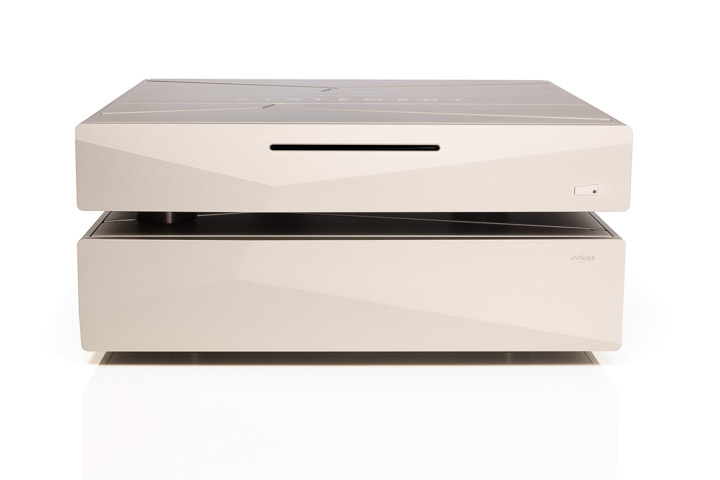 If you read my review of the Innuos Zenith SE you will know that I considered that server to be a game changer, a product that redefined what was possible with digital audio. It did that by redefining what a digital source is capable of, essentially by proving that the source is king in digital audio as much as it is with analogue. It achieved that by serving up the bits with considerably less noise than the competition, essentially producing a far cleaner and more precisely timed signal for DACs and streamers to turn into analogue. The Zenith SE was a limited-edition piece (only 100 were made) and even though it was expensive for a server (£5,000) they sold out within a year and proved to Innuos that they were on the right track. I have used the SE as a reference ever since and have yet to find its equal. In May 2018 at the Munich show, Innuos unveiled the Statement, which incorporated everything the company knew about making a totally uncompromised network server. Their demonstrations involved contrasting a Zentih SE with the Statement, the difference was surprisingly stark given that the SE had set such a high benchmark. But the Statement is twice the price and comes in two boxes. That said, it has taken a while to finally ship at the end of 2018. The Statement looks a bit like a Zenith SE plus an extra box, but a closer inspection reveals that the casework has been changed, most markedly by placing the drive slot in the centre and revising the stealth styling to suit. The top of the box also has distinctive styling which presumably adds rigidity as well as aesthetic appeal. The top case contains the SSD storage, a custom motherboard designed to minimise EMI and eight DC power rails, each with double regulation (16 regulators in total). Four rails are for the motherboard, with one each for the SSD storage, Ethernet clock, USB clock, and for the USB 5V. The lower and more substantial case accepts the incoming power and converts AC to DC in order to isolate the high voltage and keep its emissions away from the sensitive elements in the server itself. As with the Zenith SE the power supply side of the Statement was designed by Sean Jacobs, an engineer who designs and builds power supplies for Naim products among other things; if this and the SE are anything to go by, they warrant investigation. The boxes are connected by two umbilical cables, one on either side of the case and which are unusually short. This is by design, to make the system look like one box. There’s no drawback in terms of performance due to the 10mm aluminium covers on the Statement and in fact, the shorter cables do help. Having said this, Innuos can provide longer cables on-demand. The connections provided look much like those on a Zenith with network in- and outputs on RJ45 sockets for ethernet cable, a system that means you don’t need a network switch but can simply link the Statement directly to a streamer thus cutting out an electrically noisy computer peripheral. There is a USB 3.0 connection for Backup and an extra USB 2.0 output alongside a dedicated USB DAC output. This features one of two OCXO clocks (the other is for the Ethernet), both of which have their own dedicated supplies and claim 3ppb accuracy. This element was designed to improve the quality of signals streamed from both the server and the world beyond. If you use the Statement with a USB DAC its output can be controlled by one of the Squeezebox oriented third-party apps such as iPeng (iOS) or Orange Squeeze (Android), which both offer the ability to sign up to high-res streaming services. Alternatively, and rather more attractively (albeit also more costly) is Roon; the Innuos can function as a Roon Core which allows this usefully reliable and informative control application to send signal out to Roon ready DACs (and even some that aren’t). There are various ways of getting music onto this server, the simplest of which is to rip your CD collection with the onboard drive and have its software look up the metadata. But that is also the slowest and if you already have a collection of music files a bit pointless. If that’s the case you can use the my.innous.com online dashboard where there are various methods of transferring files from a computer or drive to the Statement. This is also where you can tweak metadata by correcting file names, adding artwork etc. and change settings such as whether to use the Innuos as a Roon Core or UPnP server. It’s been updated in the last year to include a quick import mode and now offers automatic artwork search alongside the option to upload your own. Like most server dashboards, it’s a little confusing to start with but doesn’t take long to understand. Of the import options, the easiest is probably via the auto import folder that appears on your desktop if you open the server, put new files in there and go to the dashboard to import them onto the drive. There is also a quarantine file for duplicates and unknown files which you can edit through the web browser. If you want to see a well organised, fully artworked collection, with a bit of homework the dashboard allows you to tidy things up so that any control app looks complete. Roon, however, is the better bet.